My mother loves homemade cranberry relish, she always has. Me, I was a died-in-the-wool devotee of “the kind with the rings on it” from an early age and only discovered the beauty of homemade as an adult. Yup, I loved the stuff from the can. Since we only had cranberry sauce on Thanksgiving and at my grandmother’s house, I thought it was her “special” recipe. She always served it in an oval pressed glass dish, all sliced up and ready to go. Which just goes to prove that even canned cranberry sauce can be the part of a cherished memory. 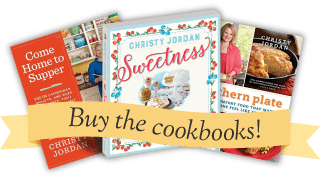 When it comes down to it, it’s not about how many hours were spent on the food, whether it was Aunt Charlie’s recipe or from the Kroger deli (but we sure do love our Aunt Charlie’s recipes! 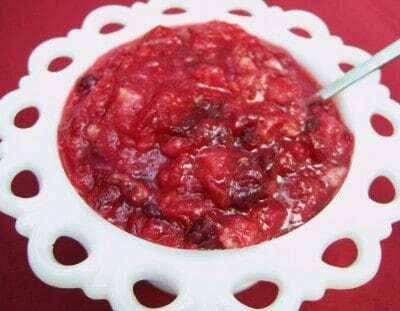 ), its the time together that counts and canned cranberry sauce can be served with just as much love as homemade. But for those of y’all who like it how my Mama does (and myself these days, too! ), here is a handy little recipe that can be made up quick as a wink and is sure to impress – almost as much as the fact that you loved them enough to make it. Isn’t it wonderful to come from good people? ~sighs~ I sure think so. 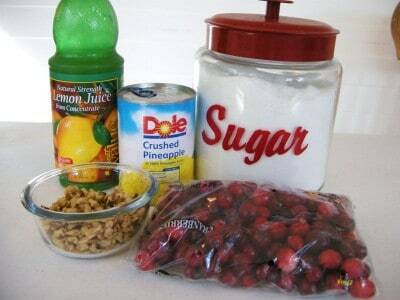 You’ll need: Sugar, cranberries, walnuts*, Crushed pineapple, and lemon juice. *Walnuts are optional. Feel free to substitute pecans or leave the nuts out altogether if you like. 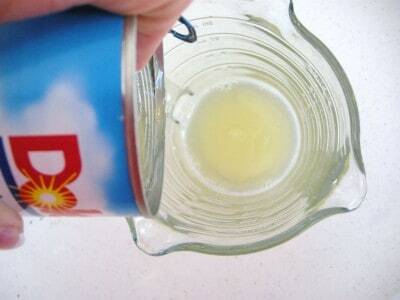 Drain pineapple juice into a cup. Add enough water to make one cup of juice. 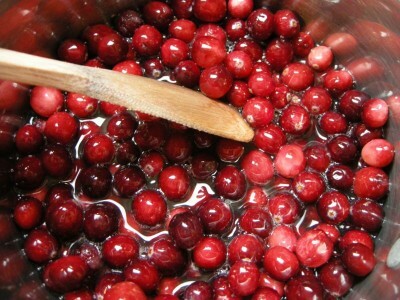 Place cranberries in medium to large sauce pot. Cranberries are so very pretty. Have any of y’all ever strung them for the tree? Stir that up and bring it to a boil, stirring every now and then. 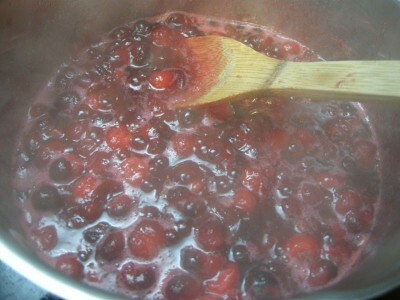 Continue boiling until all of the berries are popped and mixture is thickened. You may actually hear them pop, which is pretty cool and impresses kids. We have to impress them every chance we get. Once all of the berries are popped, remove from heat and add all other ingredients (including lemon juice). Remember, if you’d rather not add nuts that is fine, too! Pour into bowl and allow to cool. Once cool the mixture will be “jelled” and resemble store bought cranberry relish in texture, but much more impressive in taste – because YOU made it! Drain pineapple juices into measuring cup. Add enough water to make one cup of liquid. 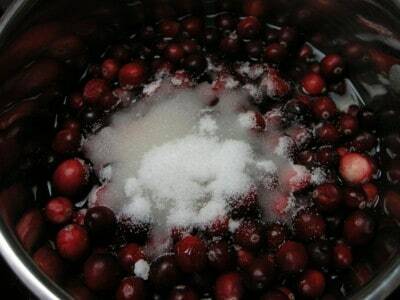 Place cranberries, cup of liquid, and sugar into a medium saucepot. Stir. Bring to a boil and cook over medium high heat until all of the berries are popped and mixture is thickened, stirring every now and then. Once all of the berries are popped, remove from heat and add all other ingredients (including lemon juice). Wake at dawn with a winged heart and give thanks for another day of living. To submit your quote, click here. Need a little pick me up? Browse through for inspiration. WIN Your Thanksgiving Turkey & Tips for More Meaningful Holiday Photos! I have an Aunt Charlie too and she’s a great cook! Hi to yours! I might use this recipe this year. I have a great one but it’s much more complicated and being that this is my first year hosting (rather than just bringing the cranberries) something simpler might be in order. I got in to big a hurry, the phone rang right in the middle of me making this and I ended up using the ENTIRE can of pineapple. UGH! Mix a large box of raspberry jello in one and a half cups of boiling water and mix well. Allow to cool and add to the above recipe for a quick fix. I fix cranberry relish with fresh, chopped in food processor berries, one whole orange, 3/4 C. sugar and raspberry jello mixed with 2 cups of boiling water. Allow to cool and add to mixture. Is terrific. 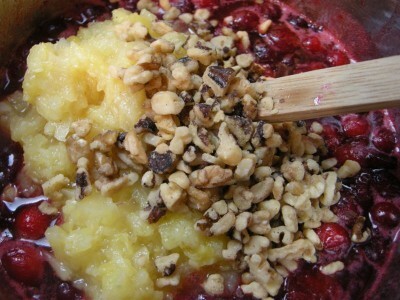 Can add crushed pineapple and nuts. Christy, this recipe looks and sounds delicious, but I have to confess that I still love canned cranberry sauce. My mother always sliced it and put in in a special Christmas dish also. I do the same. Alright now Darlene, please tell me I’m not the only one who likes to take canned cranberry sauce and moosh it up into my dressing…. But your relish sounds so good. Thank you Christy! Hey Christy! I love your website! I also love the canned cranberry sauce. I don’t honestly believe I have ever had anything else! We eat it year around and anytime you eat at my granny’s house you will have it! My husband ( I refer to him as a city boy!) thinks that cranberry sauce is only to be served at holidays! Bless his heart! P.S.-I like to eat mine with my mashed taters!!! I love it the same way Christie. I like my canned cranberry sauce mushed into my dressing too. I also like it sliced on pumpernickel or marble rye bread with cream cheese. I wonder if you could use brown sugar with this recipe? recipe looks easy enough that even I couldn’t mess it up! Thanks, again, Christy, for taking the mystery out of cooking! photos has made dinnertime planning much less burdensome for me! Now Carla, you are asking a brown sugar L-O-V-E-R so YES, I’d definitely put brown sugar in if if you are inclined to. I’m actually kicking myself for not having done that now that you mention it! Oh my gosh, this sounds SOOO good! I am trying to wean my ‘Bama boy off “the stuff with rings”! Oh, it is okay in a pinch, but this sounds so good (he loves pineapple) that we may just have a winner here! Thanks Christy!!!! I love cranberry sauce in a can. I can make some cornbread dressing and eat on it forever. Well.. until I start to turn purple anyway. I think I am the only one in the whole wide world who makes cranberry relish from uncooked cranberries. I have never, ever seen the recipe any where, but it is the BEST! Basically process your cranberries, a peeled, skinned orange, sugar and walnuts in a food processor and allow to sit for 24 hours so the flavors come together. It is YUMMY! Not that I would refuse this version because this is almost exactly as my mother in law makes it. But I’m hosting Thanksgiving this year so I can have my cranberry relish the way I like it! I make a delicious cranberry sauce, 1 & 1-2 C cranberries, 1 large orange,rind intact, 1 C. white sugar (more or less to taste). 1 TBSP lemon juice. Wash fruit and rind. Leave raw.Place all ingredients into food processor,rough chop. Taste,adding more sugar if needed. *** I make large batches, wash,sterilize, pint jars,lids,and rings. Add relish,leave approx 1/2 inch headspace. Place lids/rings on jars hand tighten.Water bath,boiling water (lids covered) for 20 minutes. These are fantastic Christmas gifts,to send family members home with the delicious relish they had for Dinner. 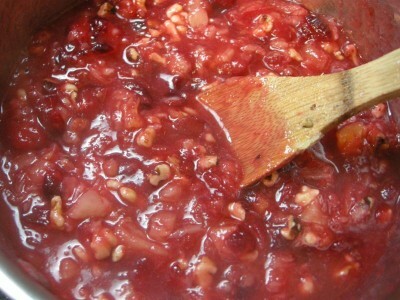 I also make this uncooked cranberry relish–actually I make both kinds so there is a choice. I LOVE the uncooked kind. I make it with black walnuts (which I buy in the South when I go home and bring back with me to NY–I am a displaced Southerner). I place a bag of cranberries, a quartered navel orange (with skin) & 1/2 cup white sugar into the food processor. I “pulse” till chopped. Then add walnuts………chill & it is yummy. No need to cook. The navel orange skin is NOT bitter but gives a deeper orange taste. For those who want it sweeter, add more sugar!! Heather, try this one. 1 cup cranberries (food processed), 1 orange, peeled, sectioned and processed, 1 apple, cored, cut up and processed. 1/2 cup sugar. mix together and leave overnight. old family recipe of ours. kids don’t like it, but I sure do. Christy, love your website. It is wonderfully set-up and the step by step is so helpful. Thank you so much and your family for giving up their time with you so you can help all of us. I’m always tempted to try making my own because it’s so pretty, but my hubby won’t touch the whole berry kind in a can so I’m not sure if he’ll go for this one. Maybe I’ll just splurge and have both. Can’t have too much food on Thanksgiving, right? Mama has ALWAYS served both!!! I love the pretty dishes! Oh, darned if I didn’t forget to say how good that relish looked! 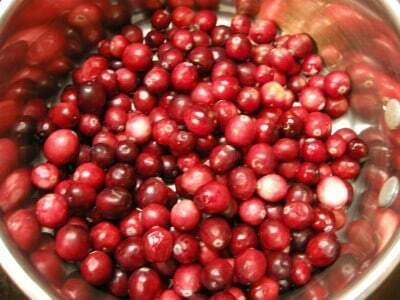 A note to Heather… You are not the only one who makes cranberry relish from uncooked cranberries. I do a very similar recipe, but I grind the cranberries, a whole orange (including rind) that has been seeded and cut into wedges and pecans. I then add about 1/2 cup of sugar. Sometimes I make a small box of rasberry jello using only the 1cups of hot water, then pour that into the cranberry mixture and chill. My mama also adds chopped celery and chopped apples. But I too like the sauce from the can. It has it’s own special place! Sounds wonderful! How far in advance can this be made? In response to Heather @ Not a DIY Life about making cranberry relish with uncooked cranberries, well I do just that EXCEPT being from the South, I naturally use Jell-O and make it congealed!!! And here it is!! Now Heather, I’m not implying that you aren’t from the South, but I just don’t know where you are from. So I’m not being mean or anything!!! LOL! And I LOVE the way you say you fix your cranberry relish. I’ll have to try it. *CLAUDINE’S NOTES: The cranberries grind better if they are frozen. 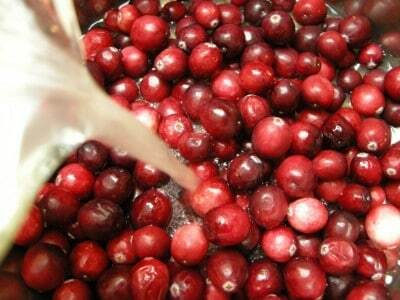 Wash and sort cranberries; grind coarsely and add the sugar. Dissolve Jello in the boiling water and let cool. Add cranberries and sugar mixture, Mandarin oranges, pineapple, celery and walnuts. Pour into a 2 quart mold or dish and chill until firmly set. Unmold onto a plate and pipe a design around edges and top with cream cheese if desired. When I first developed this recipe, Jell-O did not have the Cranberry flavor. You might want to try the Cranberry flavor instead of the Black Cherry flavor. You could use Strawberry flavor, also. My first cranberry relish using fresh cranberries. Thank you for sharing. Ooh, my oldest daughter and I love cranberry orange relish too. She will be missing it this year and it will make me sad as she is living overseas, My grandmother always made it when I was growing up and she always brought it in a beautiful green glass dish. She gave me the dish when I got married 31 years ago so I could use it in my owm home. Christy, why not serve all 3. The “solid” cranberry sauce in the can, the cranberry sauce with whole berries in the can and the “really good stuff” made with cranberries and oranges done in your food processer. All you have to do is toss the berries, the orange that has been cut into chunks and just a bit of sugar to taste. I always make mine about a week prior to serving so it can meld in the fridge. It is “really good stuff, Maynard”. (it is also good served with pork). Try it, you just might like it. I HAVE to tell you what my son did about cranberry sauce….everyone ate all the cranberry sauce (canned-solid stuff) so my son used grape jelly instead…even convinced everyone else that it was just as good…so this Thanksgiving we will have cranberry sauce AND grape jelly 🙂 Now THAT is CHEAP!!!! I had to smile at the cranberry sauce sliced and served in an oval pressed glass dish. Ditto. Mom did it, and so do I. Have you ever canned the relish went it was hot? I wanted to add these to some harvest baskets for gifts. Hey Tina! I don’t see any reason why you couldn’t can this, especially with the acidity of the cranberries. I’d just pack it hot into the sterile jars and be sure to process it in a hot water bath according to the size jars you use. Thanks for the recipe – I have a sensitivity to Red dye #40 and have had problems eating the canned stuff. For years I have just deprived myself. I shall try a new tradition this year! This sounds wonderful! I will have to try it, thank you Christy for another recipe. I am learning so many cool, neat tips and tricks to improve my “kitchen game” from SP. I always had cranberry sauce from a can (GASP!!!) I knooow…….. and I am from the South too, wow, deprived childhood, huh? So, years ago, I convinced my small son to eat it by telling him “It is jellied jello.” with a straight face. It worked, he ate it. I love it when kids try new things to eat. ~waves~ Happy Thanksgiving. Blessings on all ya’ll too. The photos of the cranberries is so pretty. I actually made my own cranberry sauce last year for Christmas and took photos that I put on my FB. lol I just thought they were too pretty not to. The cranberries, being tart as they are, were still a little too sour after I made it, but then I only made mine with the cranberries, water and sugar. The pineapple juice sounds like a good addition. I usually make the cranberry sauce with just cranberries, water, and sugar (and sometimes cloves). This year I’ll have to try your version, it looks so delicious!! I’ll give this a go this Thanksgiving. Although, I might substitute oranges instead (my family isn’t too big on the texture of cooked pineapple for some reason). I make the cranberries that are ground raw with orange and I always grind an apple into it as it makes it sweeter and a bit milder. We always called it cranberry relish. I consider it an “essential” at the Thanksgiving feast. It freezes well too. I love the canned jellied stuff sliced thin and it on a cold turkey sandwich and adds moisture. Oh, MY!!! Thank you! I’m a southern gal stuck in MI and really, really wanted to make cranberry relish for my family this year (can take the girl out of the south, but not the south out of the girl). This is precisely the recipe I was looking for. I probably will add a little chopped apple (after the relish cools) for a little added crunch. So very glad to find this website! If you want a really Wonderful taste. Try putting a can of Vernor’s Ginger Ale Soda in with the cranberries. That ginger taste mixed with the tart cranberry flavor and some orange peel just has that special Holiday smell and taste to it. I always use brown sugar as well. And a pinch of salt. It is O.M.G. Good. (Oh My Goodness) Good. Hope Everyone one has a wonderful time with their special folks this Thanksgiving. ” Remember ” Treat every special gathering like it might be the last. For some it truely might be. With Love to all. Stephanie-SoutherngirlinOcala. This reminds me of the one I make every year…but mine has a little twist. There is never a bite left in the bowl. EVER. AND they beg me to make it throughout the year as well. Here is my version! It’s beautiful in a clear or clear pink bowl…I use one of my grandma’s depression glass bowls. 1. Drain crushed pineapple and save 1/4 cup of the juice. Dissolve gelatin in 2 cups of hot water. Stir in cranberries and crushed pineapple. Pour 1/2 of the mixture in a bowl and leave at room temperature, set the other 1/2 in the refrigerator until firm. 2. In a separate bowl mix together the cream cheese, mayonnaise, reserved pineapple juice and chopped pecans. Spread mixture over chilled gelatin. Place in refrigerator for 10 minutes. Pour the room temperature gelatin over the top of the cream cheese layer and refrigerate until set. My mama served canned cranberry sauce in a glass dish and I have a glass dish like it that I serve on too! I’m sure your mama’s is wonderful. Paula Deen slices her canned c. sauce and puts a mixture of mayo., cream cheese and pecans between two slices. Haven’t tried it tho. By the way, do you have a day off in a couple of weeks to go with me to lunch? I know you’re a busy woman, I was thinking it would be nice to go out during this time of year with all the decorations up and everything. If not, we can always wait until after the holidays. Love ya! We always had canned as a kid too…all sliced so pretty on that cut glass plate. But now that I live close to where I can get the cranberries fresh, it’s homemade relish for us as well. It’s so easy, not alot of mess or time involved, but boy does everyone think it’s the best thing goin’. Thank you for your recipe, may have to change mine up a bit this year. Oh, and AngelMass, you are my new hero…a friend, years ago, brought your recipe to our Thanksgiving, did he bring the recipe…nope…but I’m sure yours is it…it was heavenly! I also love canned cranberry sauce, especially with the whole berries! I bought mine yesterday, then saw this recipe. So today, I bought the stuff to make your relish! How far ahead can I make it? PS I work with your kids at school – they are really sweet!